My husband started telling me about these mushrooms in the front yard this morning. He said at first, he thought that they were skins of cantaloupe which someone threw there. I ran out and got some shots. I felt and looked but could not find a stem. What are these? I pulled the mushrooms from the ground and there were no gills. It smelled like a button mushroom from the grocery store! I didn't eat it buy it made for some good fun!! Wow, do you live in mushroom utopia or what? Those look like giant puffballs! 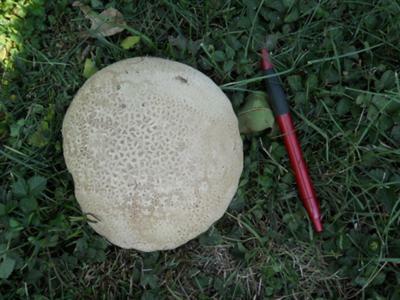 You know those little puffballs that you so enjoyed stomping on as a kid? Well, those cantaloupes are probably just a larger species. -They grow on the ground in meadows or grassy fields rather than in forests. -They appear in late summer to early fall. 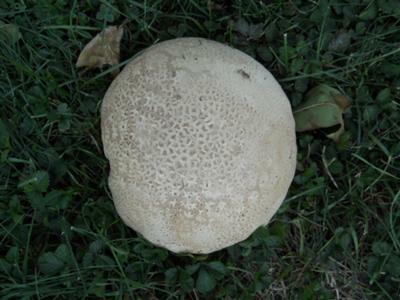 -Giant puffballs are all white, with white, firm flesh inside. As always, if you're planning on eating them I highly recommend showing them to a local expert in your area. Don't rely on the Internet alone for identification when eating something. Especially if it can be mistaken for something poisonous. That said, your mushrooms are starting to look a little long in the tooth (long in the gills?) and might not be good for much longer. The dog in those photos could totally ride on that mushroom!